A fisherman in the TMP. Kudat: A recent dialogue in Kudat for the Sustainable Fisheries in Tun Mustapha Park (TMP) has allowed great opportunity for approximately 30 participants from Kudat Fishing Boat Owners Association, Fishermen Association of Kudat and Kota Marudu-Pitas to convey their concerns and issues to Government agencies such as the Department of Fisheries Sabah (DoFS), Sabah Parks, Malaysian Maritime Enforcement Agency (MMEA), Marine Police, Ko-Nelayan and WWF-Malaysia. 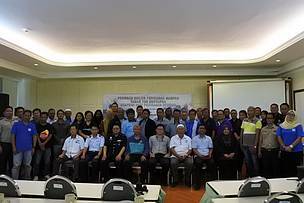 One of the various ways stakeholders of TMP support responsible fishermen and fish farmers is through organising and attending platforms for Government agencies, fishermen and communities, as well as NGOs to foster networking and collaboration between agencies and departments related to TMP. In conjunction with World Fisheries Day, Sabah Parks, the Department of Fisheries Sabah and WWF-Malaysia took the opportunity for key stakeholders to be on the same page concerning the Governments’ direction in developing the fishery industry in TMP and ensuring the protection of the fishermen community through sustainable fisheries development and management approaches. 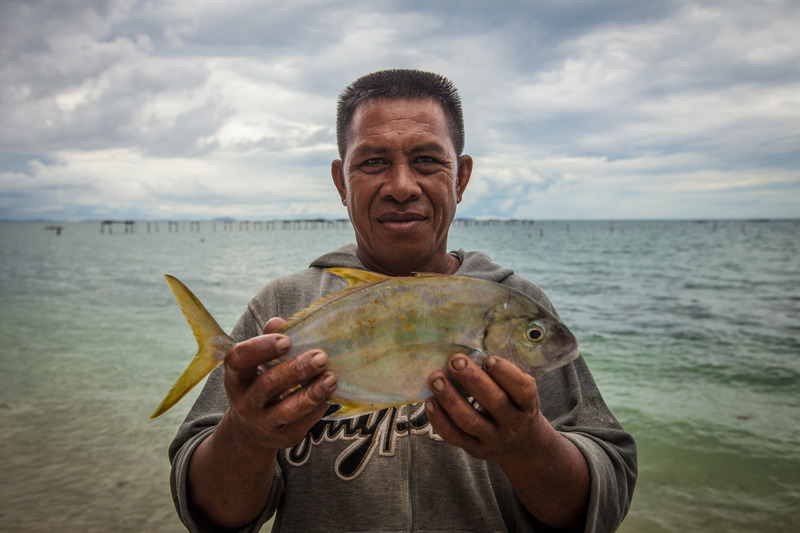 The belief of the important linkage between oceans, seafood and people is one that is agreed upon between various stakeholder of TMP – one of the largest natural parks and first multi-use park in Malaysia, measuring up to approximately 900,000 hectares. “As a multi-use park, TMP comprises individual zones with their respective strategic objectives. These are Preservation Zone, Community-Use Zone, Multiple-Use Zone, and Commercial Fishing Zone. The needs of both the local community and the fishing industry have been carefully considered right from the beginning in determining these multi-use zones,” said Mr Fazrullah Abdul Razak, Assistant Director (TMP) of Sabah Parks, during his presentation. He also made a strong call for commitment from all sides in order for the implementation plan to work. This was an important statement especially aimed towards the fishermen community present during the dialogue. Attending were participants from the Fishermen Association of Kudat, Kota Marudu-Pitas, and Kudat Fishing Boat Owners Association. Supporting this was Mr Lawrence Kissol, Head of Marine Resource Management Office of Department of Fisheries Sabah (DoFS), who presented on the management strategy and development of the fisheries sector in TMP using the Ecosystem Approach to Fisheries Management (EAFM) as well as the role of DoFS and collaboration with other agencies to achieve this. “It is unfortunate that some fishermen communities demonstrated their disapproval on the TMP zoning plan. At the same time, we are grateful they had this dialogue to be able to voice out their thoughts and strong discontentment towards this. From here, we are able to see the issues we need to address in order to work towards an agreeable outcome,” Mr Kissol said. Mr Fazrullah Abdul Razak during the dialogue said that protecting habitats and biodiversity conservation for food security and human well-being are important. Better understanding and strong commitment from all parties of TMP will allow the development of the fishery industry in TMP while fishermen communities are protected through sustainable fisheries development and management approaches. Further concerns and issues after this dialogue can still be brought up formally to Sabah Parks. 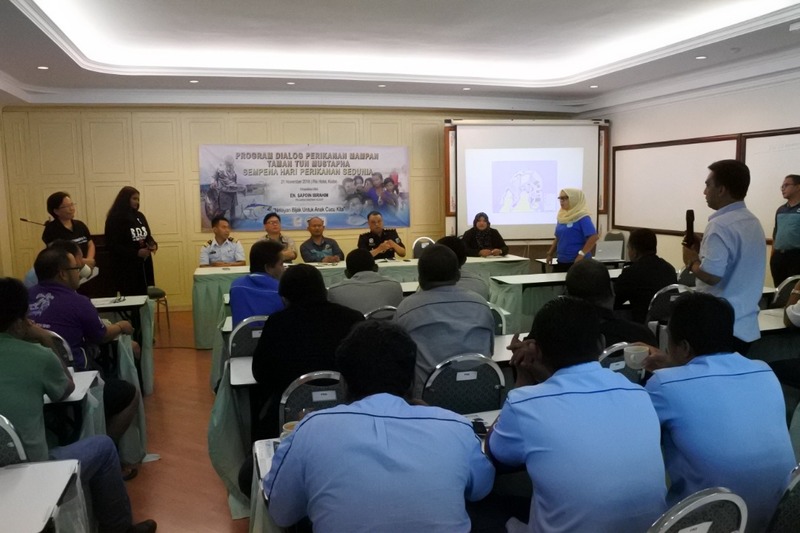 Among issues raised during this dialogue by the Fishermen Association and communities were the need for further clarification on the fisheries activity areas and zones in TMP, the number of monitoring Honorary Rangers in the park and the fishermen’s source of income due to the zones. Issues were then addressed on the spot by supporting agencies such as MMEA and the marine police who mentioned that enforcement will be strengthened to enhance the capacity to monitor TMP more effectively. 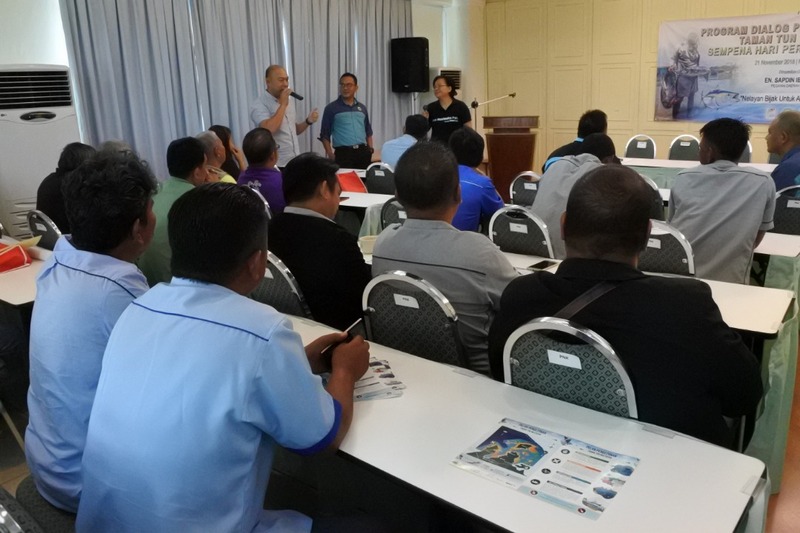 This half-day dialogue on Sustainable Fisheries in TMP was held at Ria Hotel, Kudat. It was officiated by Kudat’s District Officer, Mr Sapdin Ibrahim, who reminded us that we are all part of TMP. “My call is for everyone participating in this dialogue to work together to raise the image of TMP as a marine park that we are proud of and recognised internationally,” Mr Ibrahim concluded. 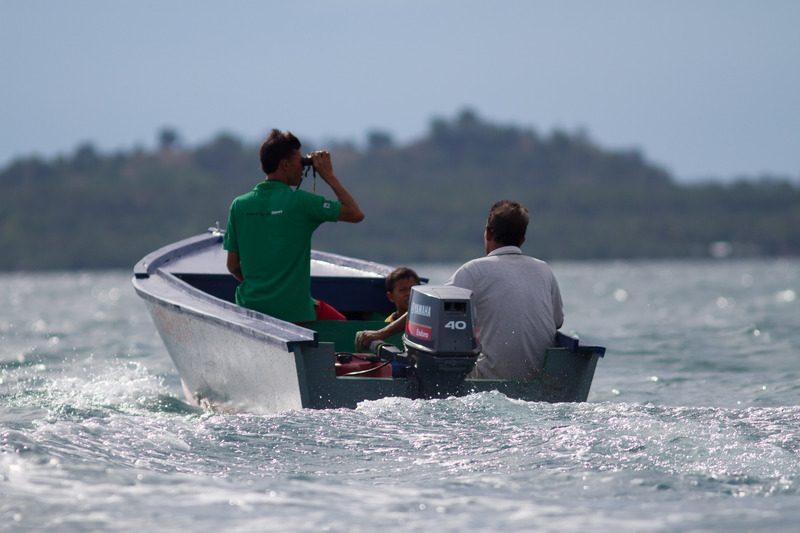 Fishermen and communities within the TMP. A group photo at the dialogue.